For decades air gauging units have been used for dimensional measurements. They have been applied in many technological processes, especially in the systems of in-process manufacturing control or any type of production environment. They were initially invented in France before the Second World War by a carburetor company that was looking for a more reliable method of measuring its carburetor jets. The primitive air gauges used a simple yet efficient back-pressure operation technology. They provided the basis for the development of practically all types of air gauging units that are used today. Air checking units utilize compacted air to gauge changes in liquid flow rates. Such tests can determine the attributes and measure distances between precision orifices and the work-piece. They offer sufficient magnification and reliability in order to measure small tolerances. They can easily determine dimensions with tolerances that are smaller than 0.005 inches and when gauging tight tolerances, they can help to achieve a resolution as small as 0.00002 inches. Since air gauging is a non-contact firm of gauging, it is perfect for measuring extremely thin-walled parts for soft materials. To put it simply, Air Gauge Units measure length. They rely on the basic law of physics that states that flow and pressure are directly proportionate to clearance and react inversely to each other. Closing off of open-air jet results in back pressure building up in the channel from the air supply. This backpressure can be graphed on a pressure-distance curve and thus, as the open-air jet becomes more restricted, the backpressure consequentially builds up. The pressure-distance curve created by this effect is repeatable and usable for displacement measurement. According to George Schuetz, Director of Precision Gages at Mahr Federal Inc, “The pressure-distance curve is what makes up the air gage and is what ensures its practical use on the shop floor. We have introductory information from the 1940s about air gaging, and the tooling and applications have not changed dramatically from those times, it’s simply built upon the laws of physics. The air tooling itself is just an accuracy chamber that for the most part holds two outside planes which feed to a typical channel. The clearances are critical, however, the limitation set on the outside fly makes weight be developed which can be estimated. Back in the 1940s, individuals comprehended the significance of the two planes for differential estimation. They likewise realized that more streams could be included for finding geometric condition-or that decrease, straightness, and other related conditions could be estimated with air tooling. In other words, as the clearance in the air gauge increases, the air flow also increases and thus, air pressure decreases proportionately. As clearance decreases, air flow also decreases, and air pressure increases. This phenomenon is achieved by creating a regulated air flow that travels through some type of restriction, such as a needle valve, and then through the nozzle in the air gauge. As the obstruction is brought closer to the nozzle, the air flow is reduced and the back pressure is increased. When the nozzle is completely obstructed, the air flow becomes zero, and the back pressure is equal to the regulated air. In a similar manner, when the nozzle is open to the atmosphere, air flow is at a maximum, and the back pressure is at a minimum. 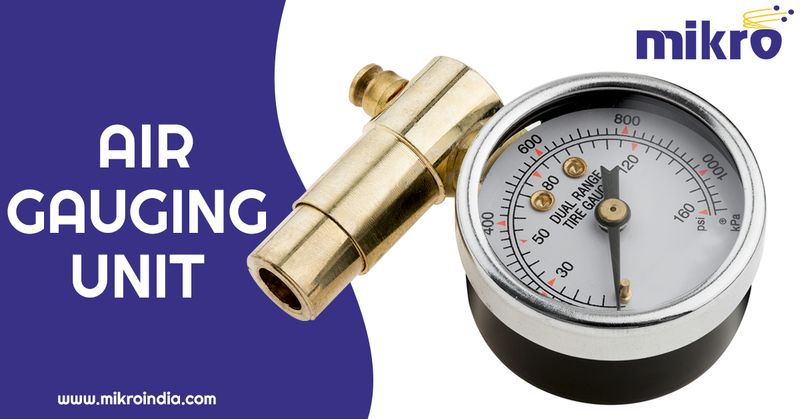 The different types of air gauges are based upon variations of two basic principles of compressed air: pressure and flow. Pressure-type gauges monitor the back pressure within the gauging circuit as the product size changes. Flow type gauges monitor the amount of air passed through the circuit as the product changes size. Air gauging units are manufactured as per their application and thus, there can be a variety of uses and types. Mikro is a premier company that offers you a wide range of air gauges that are ideal for your manufacturing processes.